Photography websites and online portfolios are often confused. While the former put a special emphasis on the blog aspect, the latter are more photo-centric. If you are looking for a ready-made design that can become the rock-solid foundation of your photography website, look no further. In this blog post today we will showcase 20 of the best WordPress themes for photographers that you can download at no cost. Support of grid-based photographs, manageable galleries and full-width sliders – these are some of the main features we take into consideration when choosing a photography theme. However, there are many other aspects to which we should also pay attention when picking a theme. The ability to scale to any screen resolution is an indispensable property of any online resource that wants to be competitive. An attractive slider is a proven way of capturing visitors’ attention. Quality thumbnails provided under the main slider can showcase many other projects of yours and motivate the visitor to click an image to see it fully or browse a gallery. As a rule, photography websites feature a lot of images, and it is simply impossible to showcase all of them via a slider. That’s when blog posts come in handy. If the theme you’ve selected is coded with a clean and valid language, then your site can reach the top of search results. If the aforementioned factors match your criteria of a perfect WordPress theme for a photography website, then you should enjoy our selection of ready-made designs below. 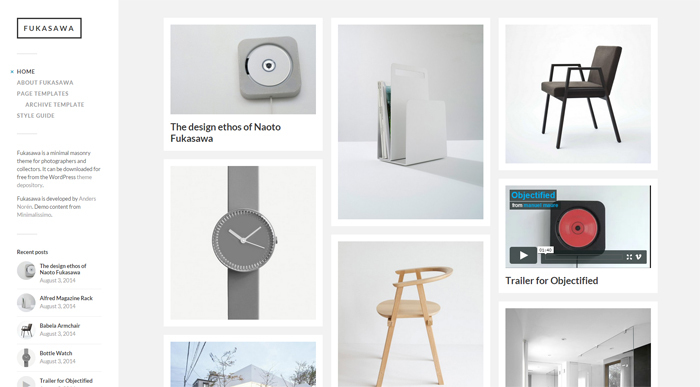 Beautiful and functional, all of them can be downloaded for free. Fukasawa is best suited for photographers and collectors. Featuring a Pinterest-style grid, it can be used for content-heavy websites. Posts, images and videos can be organized in a balanced, easy-to-scan way. 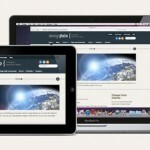 Retina-ready images and fully responsive layout will look great on any device. 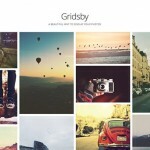 Gridsby is a free photography theme for displaying images in a Pinterest-style grid. Main menu and categories are hidden, which allows you to save on space. By clicking any photo from the front page gallery, users will be introduced to a page with a more detailed overview. 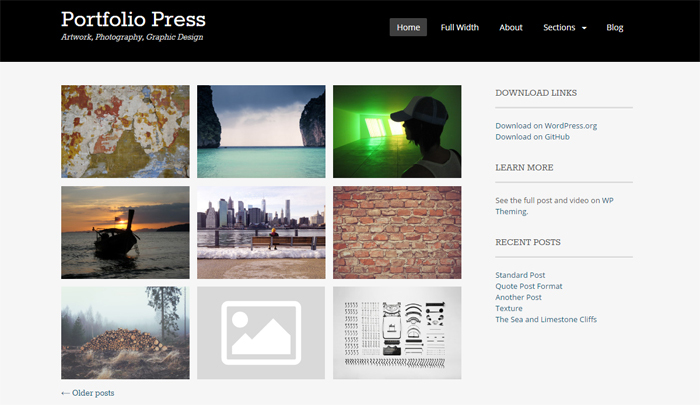 Photography Portfolio is a beautiful photography WordPress theme designed by TemplateMonster. Its clean and minimalist layout allows users to focus on content rather than multiple design elements. A fixed menu bar, back-to-top button and grids significantly facilitate navigation. TwentyFourteen will help you save your time and money on developing a magazine-style website. The template allows the featuring of the home page content in a slide and grid-based list. A fully responsive layout will run smoothly on any device. 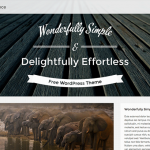 Thanks to three widget areas you can feel the ease of a WordPress theme customization. 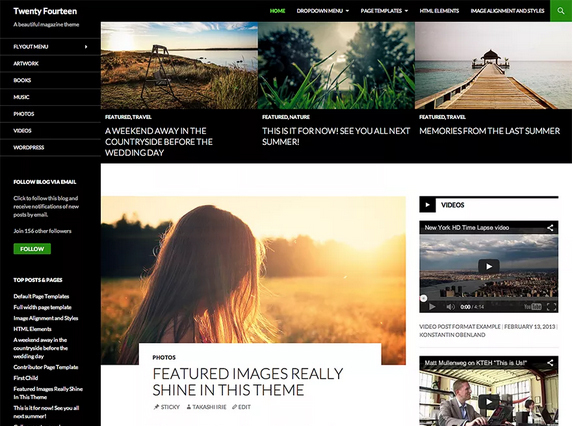 Pictorico can be used for both portfolio and photo blogging websites. A large header slider and grid-based galleries allow you to showcase your works in a more captivating way. Every element of the theme can be customized the way you wish, including the header and background, menu, post formats, and sticky posts. Portfolio Press looks clean and simple. It is best suited for showcasing photo, art and design projects online. You can change the layout and upload new logos by means of an options panel. Electa can be used for both photo blogging and portfolio websites. The main menu was moved to the left sidebar, which brings a photo gallery to the foreground. 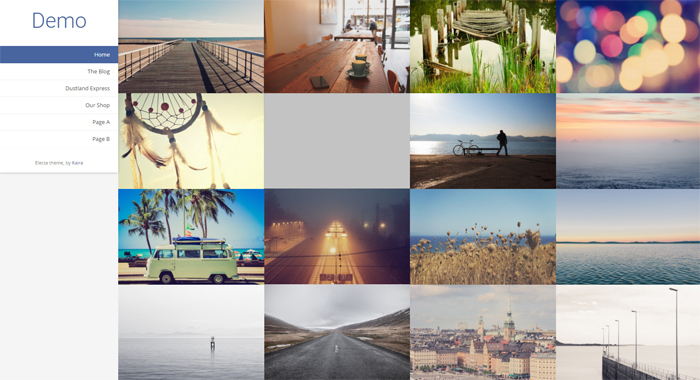 Photo thumbnails were organized in a grid-based list, which adds to the visual aesthetics and functionality of this theme. Snapshot features a slider and gallery type thumbnails which lead to single pages. The upper area of those pages is devoted to showcasing photography, whereas the bottom of the page features description and comment sections. As its developers say, Influence is incredibly simple front and back. A responsive, scaling video slider welcomes in every visitor. Users of any device will see the content as it was intended. When not needed, the main menu simply slides away. 4-tab Admin dashboard provides for seamless customization of the theme. Art and photography, beauty, fashion, design or any other creative project can benefit from Melissa. 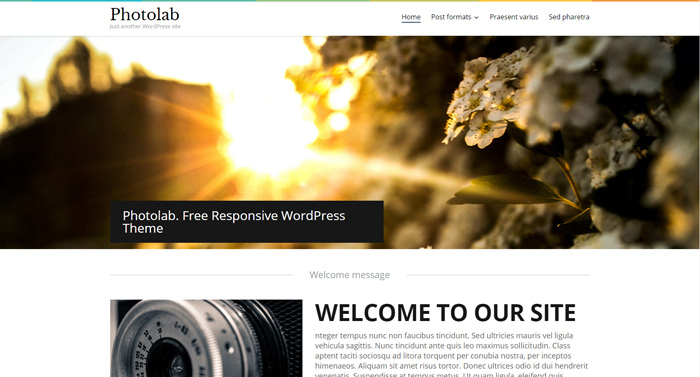 This is a fully responsive WordPress theme that comes loaded with advanced functionality. Sliders and galleries were integrated for a more captivating online presentation of your project. The custom admin panel was made simple and intuitive to allow those users who are not tech-savvy to set up a photo blog without much effort. 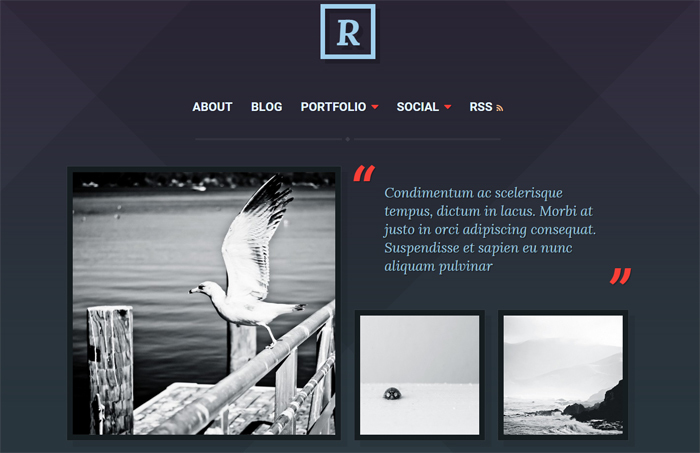 Ravel is a clean and stylish freebie intended for developing a photography website. With the main emphasis on images, the theme will be a perfect solution for showcasing your works online effectively. Theme customizer allows you to manage the template the way you wish, adjusting tabs, header, sidebar, texts and images, etc. 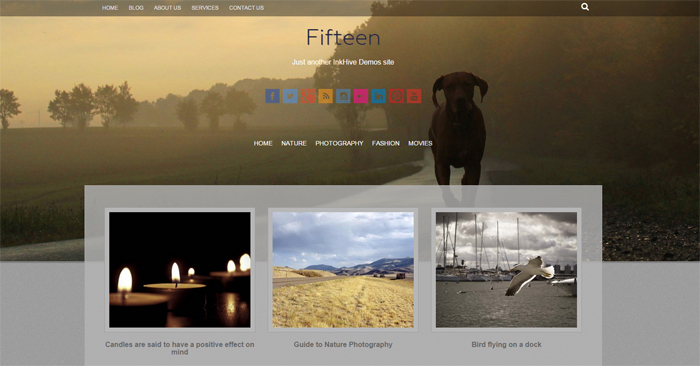 Fifteen is a stylish free photography WordPress theme with vivid social sharing options in the header. The home page features a grid-based structure. 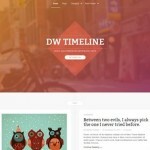 A beautiful hover effect adds to the theme’s interactivity and visual appeal. 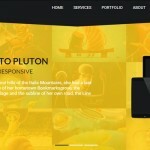 Like the rest of the themes from this list, the template was made fully responsive. Retina-ready images will look sharp on latest-gen devices. Translation-ready and SEO-optimized, your website will be accessible to international customers. 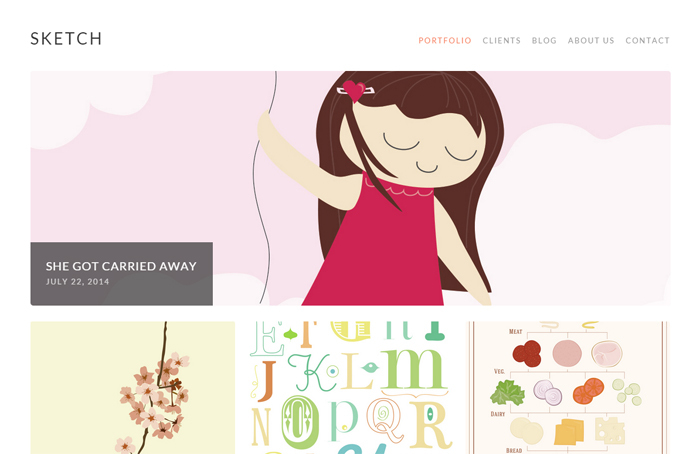 As the name implies, GK Portfolio is a portfolio WP theme. 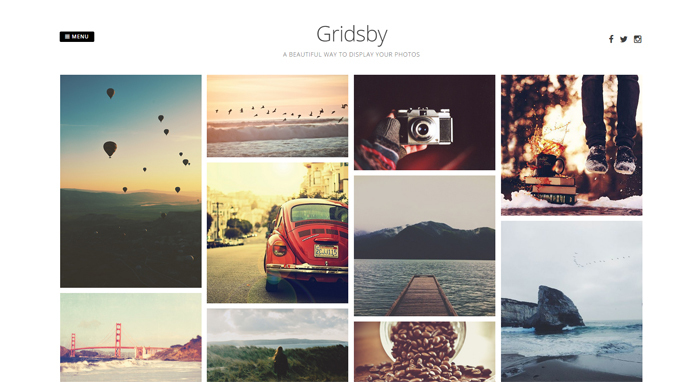 Its grid-based layout will showcase your most recent projects online beautifully. 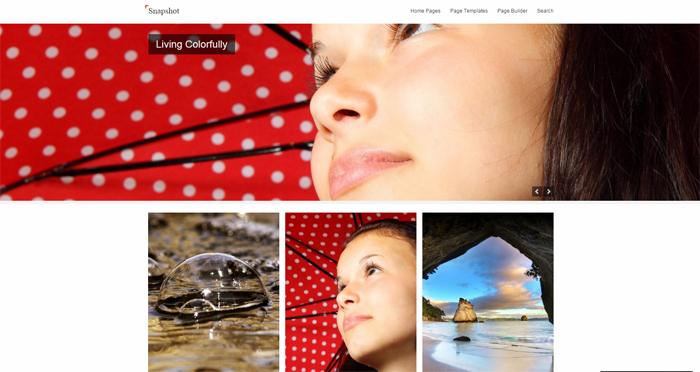 This image-centric photography theme features a fully responsive layout that adapts to any screen resolution. Social sharing buttons were integrated to expand your social media reach. 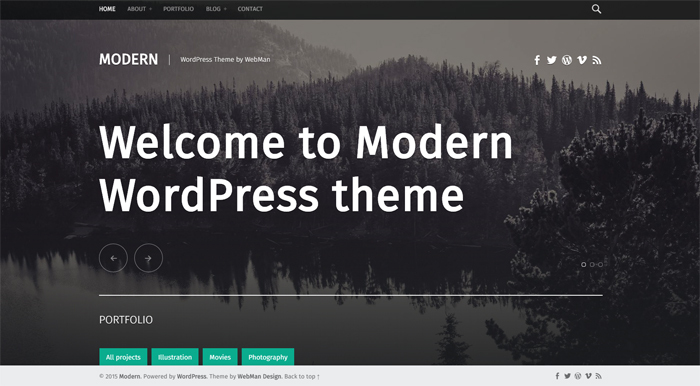 Modern is a photo blogging and portfolio freebie that can suit both small businesses and personal projects. It features a translation-ready code, crossbrowser compatible layout, Jetpack plugin, Schema.org markup, Theme Hook Alliance action hooks, and many other great features. 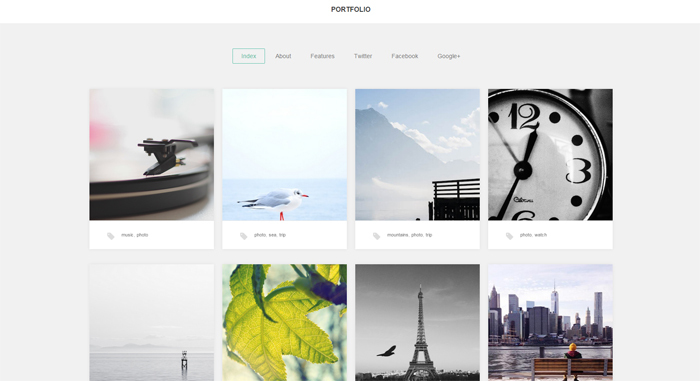 Photolab incorporates a clean layout with a flat design approach. Featuring a standard set of pages, the template is mostly focused on a blog. Articles, photos, videos and quotations are more vivid, when contrasted with a light background. Sketch was designed in a clean style to bring focus to your projects. An easy-to-follow, dropdown menu will make it easier to navigate through your pages. 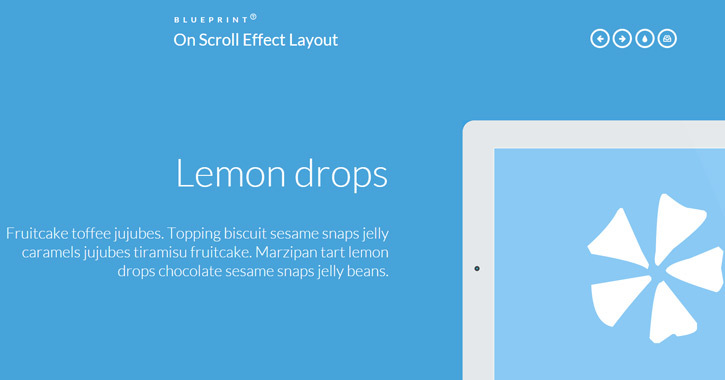 A bold slider at the top of the main page will trigger users’ curiosity and invite them to investigate your projects. Social sharing options were also integrated to make it easier for your visitors to share the photos they like with their friends online. 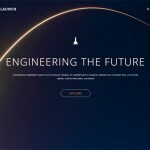 If you are looking for a parallax scrolling template that would feature a host of handy elements to impress your site visitors from the start, then pick Amplify. 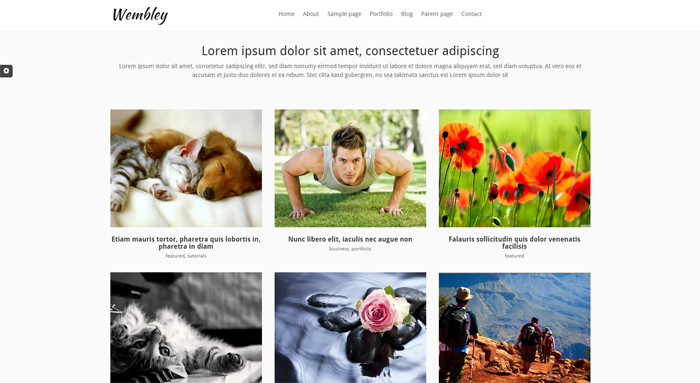 This is a responsive WordPress theme for a photography website that you can grab at absolutely no cost. 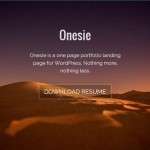 8 page templates, Google fonts, a powerful theme customizer, Live Composer, social sharing options, and a number of other handy features are included in the package. 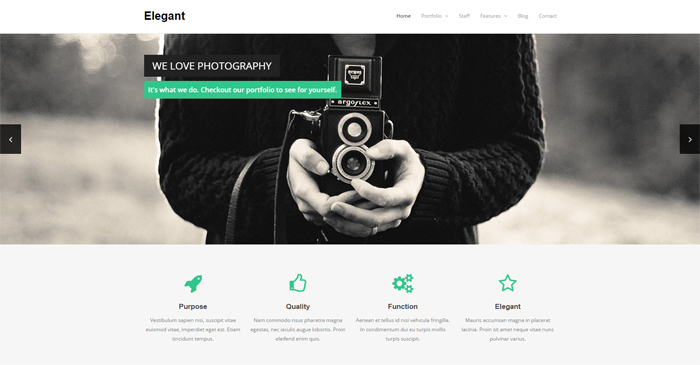 Bloggers, photographers, small businesses and non-profits can build their online presence with Elegant. 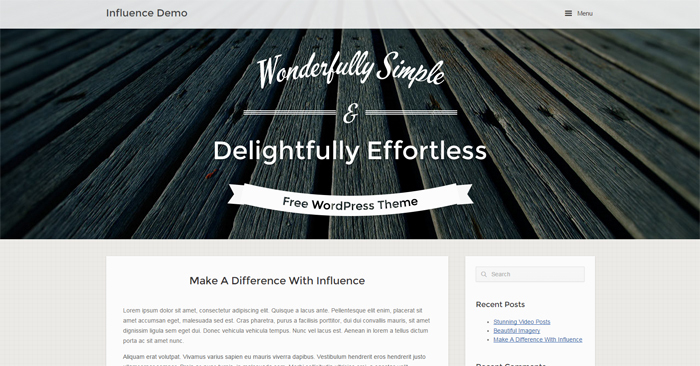 This free WordPress theme is easy to setup and manage. Built-in custom post types will make it much easier to add and edit the homepage features, portfolio and staff page. 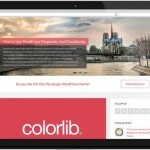 WordPress theme customizer was also integrated for seamless customization. 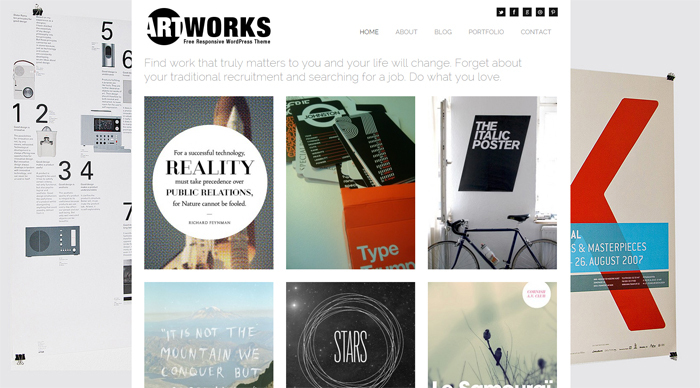 ArtWorks is a tile-based free WP theme with infinite scroll, simple layout and clean code. 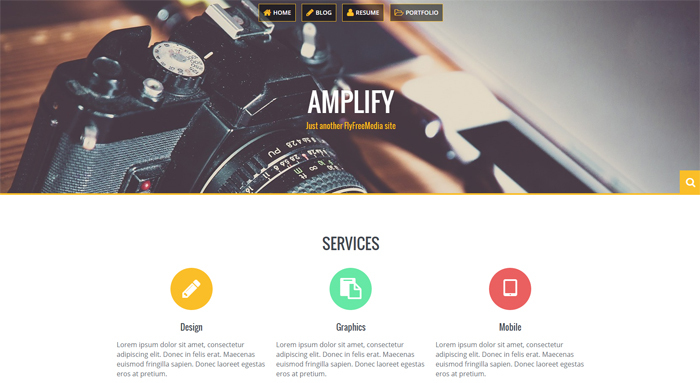 The template is fully customizable and comes integrated with many useful widgets. Mobile-friendly and crossbrowser compatible, it will help you expand your client base. Wembley is the last but not the least theme in this collection. This is a photo-centric theme that is best suited for blogging and portfolio platforms. It comes with a standard set of pages, which can be customized just the way you wish. The layout features a grid-based structure and simple design, which draws users’ attention to your portfolio. If you are a photographer and you are earning your living by taking awesome pictures, then why would you take risks with your online presence? 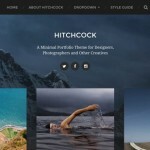 With the help of these free photography WordPress themes you can develop a fully-featured web resource that would look good on any device, adapt to any screen resolution and rank high in the major search engines. Just go ahead and enrich your collection of web design stuff with some cool freebies!